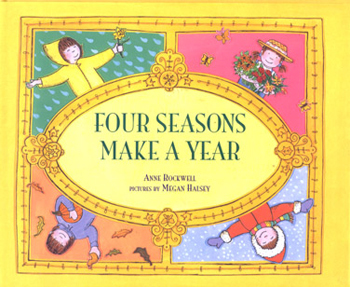 Beloved author Anne Rockwell takes young readers through the year. In the spring, leaves sprout, showers come, and it's time for planting. Bees buzz and roses bloom as summer arrives. The fall turns pumpkins orange and leaves red and gold, and the wind grows cold. In wintertime, snow twirls down, and the flames in the fireplace leap and glow. Megan Halsey's charming collage illustrations are the perfect complement to this delightful introduction to the wonders of the seasons. Look for the other Rockwell/Halsey titles!